March is the month many St. Louisans begin cleaning off their patios and porches. While we still experience some colder days in March here in the St. Louis area, we don’t get bent out of shape. We know warmer weather is just around the corner. Warmer temperatures means more opportunity to get outside and do the things we love. 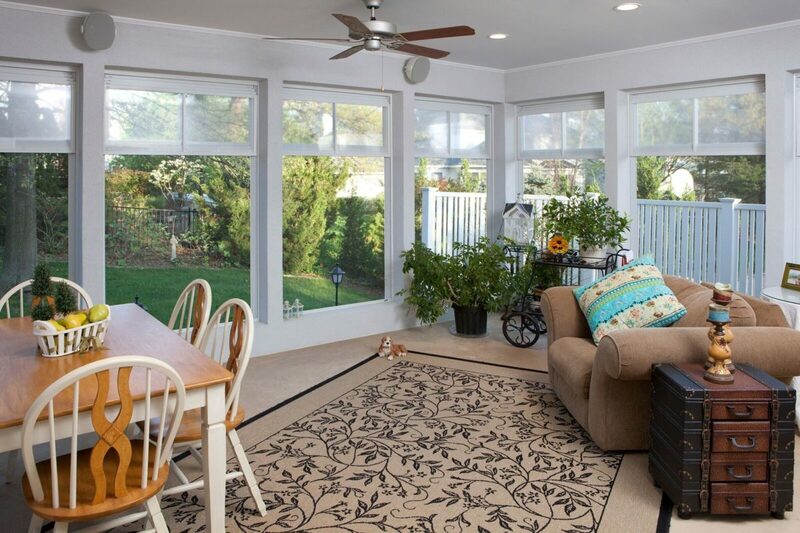 Roeser Home Remodeling knows one thing our St. Louis friends and family love is screened-in porches. The ideas for screened-in porches are endless but one thing they all have in common is that they are designed to bring our love for the outdoors in, into our homes. If you are considering a home remodel that encompasses your love for the outdoors and are wondering where to begin, Roeser Home Remodeling can help you design a style that fits your home and your families need. Is there anyone who can say they have enough closet space? I don’t know of anyone who has empty closets. It seems that if there is a closet, we find a way of getting them filled. Having them organized is sometimes another story. Roeser Home Remodeling can sympathize with the frustration of not knowing or being able to find what you need when you need it. We can help you with that! Just because you have a closet doesn’t mean it is functional for what you need as a family. When it comes to home remodeling, closet space cannot be overlooked. Especially if you have a growing family, the need for functional closet space and storage isn’t a luxury, it’s a necessity. 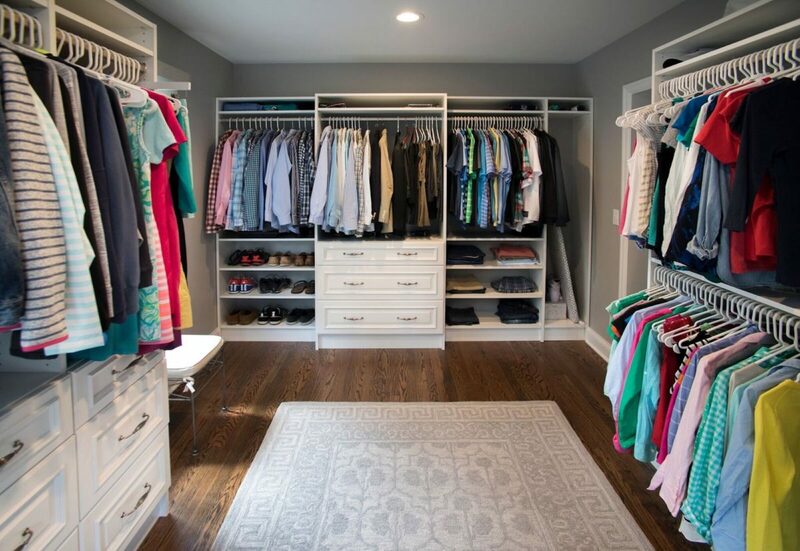 Whether you are planning a complete home remodel, or the remodel of specific rooms, closet and storage space are an important aspect to consider. Roeser Home Remodeling can help you go from idea to plan and then reality in creating the closet and storage spaces of your dreams. Roeser Home Remodeling of St. Louis has won “Best in Design“on Houzz®, the leading platform for home renovation and design. The was chosen by the more than 40 million monthly unique users that comprise the Houzz community from among more than 2.1 million active home building, remodeling and design industry professionals. Follow Roeser Home Remodeling on Houzz. Few of us can think about porch sitting without having sweet memories of our childhood. Perhaps our earliest recollection of porch sitting is at grandma and grandpa’s house. Those memories of porch sitting are so vivid in our minds that we not only remember the porch but also the sounds, the smells and the company we kept. Many of us probably had grandparents who had a nice porch off the back of the house. Maybe it overlooked a lawn or garden area. Many precious memories can be made, sitting idly on a porch. Fast forward to our day. Now that we are adults with families of our own, we look for ways to incorporate those nostalgic memories into our modern outdoor living spaces, or porches of today. Roeser Home Remodeling loves designing outdoor spaces that bring back those childhood memories of porch sitting and provide the space for your family to make additional memories of your own. Porch sitting nowadays, has many similarities of porch sitting in times past. Family and friends having sweet tea, lemonade or coffee over conversation while enjoying fresh air and sunshine, an evening of margarita’s, craft beer, or wine tasting, playing cards or board games, or snuggling on the swing, a reading nook, or private area for meditation and contemplation… the list goes on and on. Not only does porch sitting create memories, but also helps to solidify strong bonds between family and friends. Many modern homes have porches designed to provide a beautiful, inviting entrance that says, “welcome” to neighbors and friends. Roeser Home Remodeling can create a porch space designed to have curb appeal and add value to your home while not compromising the welcoming spirit. Sitting areas can be designed and decorated to your taste. Outdoor furniture, while once only consisting of swings, stools or rocking chairs, now includes wicker, treated wood and furniture designed for comfort with padded seats and pillows. Decorating in calming or vibrant colors can add a flare of your personality while giving you an added area to linger and talk. There is nothing quite like porch sitting. It is not just an activity, it’s a feeling. A feeling of home, part of our culture as Americans. While once considered a status symbol in America, it has now become something most of us long to have. A way to step back, take a moment to breathe and enjoy our life with the people we love. 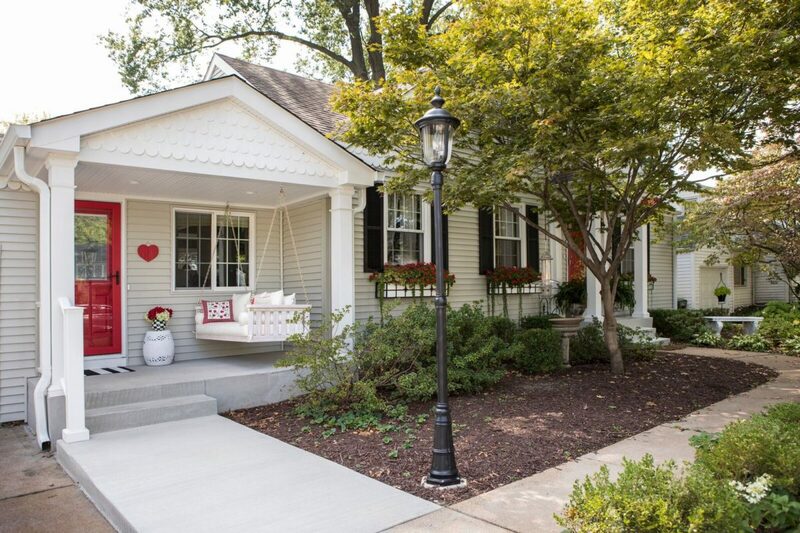 Roeser Home Remodeling of St. Louis can turn your porch sitting dreams into reality. From idea, to plan, to final solution, your outdoor remodeling project will look amazing when completed and bring back the nostalgia of days gone by. You know you want a new kitchen remodel. The kitchen you are trying to survive in is just not cutting it. It leaves you feeling isolated. Cut off from other areas of your home. It is small. 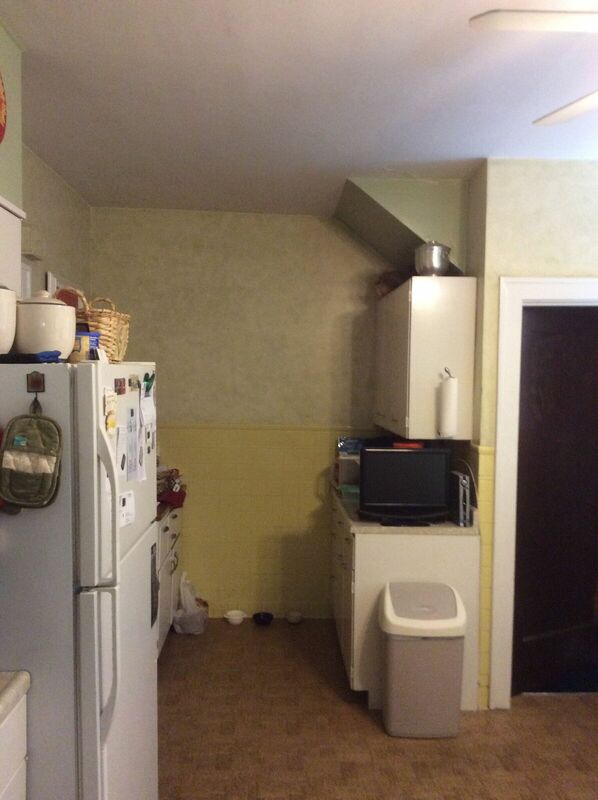 There are insufficient countertops and cabinets. It is outdated and drab. You love to cook for your family but find little or no motivation to try new recipes or feel excited about the culinary art. You can’t get organized or find what you need when you need it. 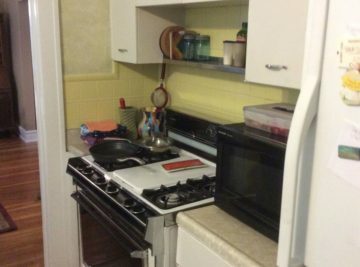 You’ve tried it the Marie Kondo way and realize that your kitchen just does not spark joy. It is exhausting trying to function in this outdated, drab kitchen! So, you pour over designer magazines and search the internet for ideas, yet you find yourself becoming more frustrated and unsure of what best fits into your family needs, wants, and budget. After all, you think, how can my existing kitchen ever come near to being my dream kitchen? Even the floor plan is all wrong. It would definitely need a major overhaul. Is there anything that could make it better? Roeser Home Remodeling in St. Louis can feel your pain. Sometimes, it is hard to see how your kitchen remodeling vision can be brought to life. We speak with customers everyday about how hard the process of kitchen remodeling can be without having expert guidance. Roeser Home Remodeling has the expert advice you need, and we want to help ease the process. We are a family run business, we value people and care about how you live in your home. Even the drabbest of kitchens can be renewed to a beautiful, modern, functional dwelling space. So, how can Roeser Home Remodeling “spark joy” for you in your kitchen? We begin with your idea and vision of what you want your kitchen to be. Once the idea is in place, the next step is the plan. From the plan, we move to the process of creating the kitchen of your dreams. You are with us every step of the way, and once the project is completed, it will look amazing, be functional and bring you great joy. It may be that the floor plan will have to be re-vamped. It’s not a problem that the experts at Roeser Home Remodeling cannot undertake. There are also, other considerations in a kitchen remodel. 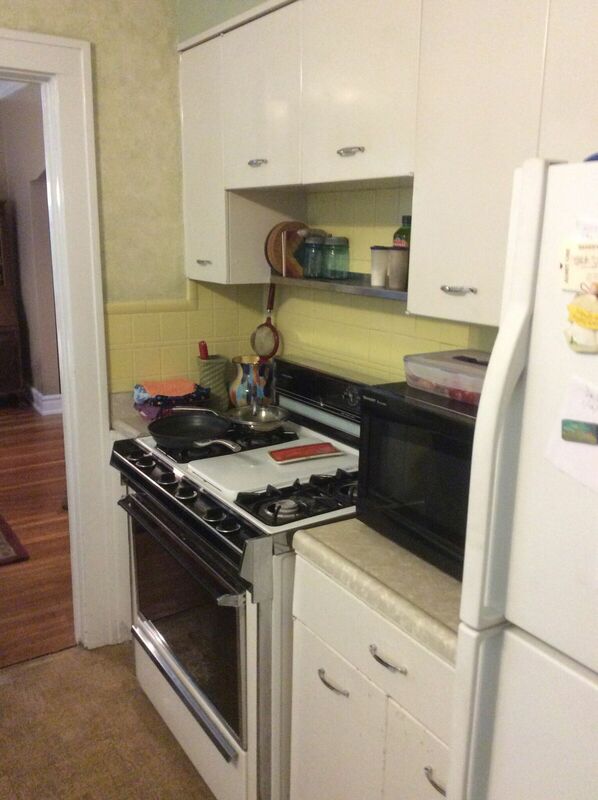 Do you need new cabinets, or should they be painted or re-surfaced? Your vision, the overall quality, and floor plan will be a determining factor. Roeser Home Remodeling will show you all your options. From countertops, appliances, useable space, flooring, cabinets and hardware, you will have many options to achieve your dream kitchen. Taking the first step, having a general idea and meeting with our design team will put your mind at ease. Kitchen remodeling doesn’t have to be overwhelming. 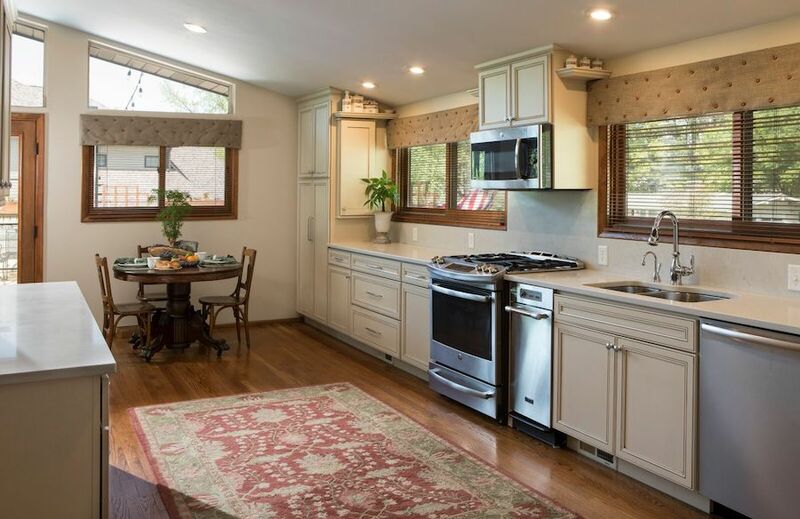 Let the experts at Roeser Home Remodeling in St. Louis show you how you can go from drab to fabulous and have a kitchen that invites not only family and friends, but also makes you feel at home and comfortable in your new remodeled kitchen space. Giving the gift of a remodel is a great idea. 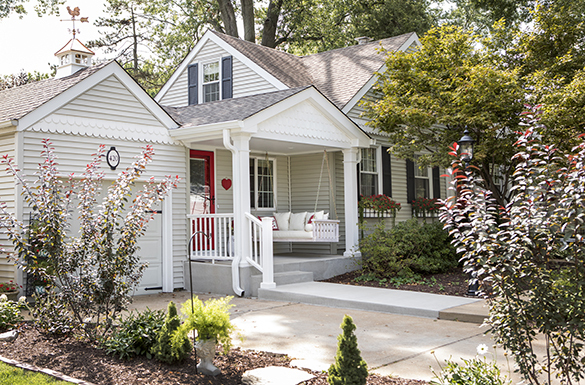 Sure, it’s nice to give something all wrapped up in paper and bows, but the gift of a remodel is a gift that will be celebrated throughout the coming year. Kitchens and bathrooms get so much use. The fixtures and function can wear out quickly with the heavy traffic of family and guests. These rooms often show signs of wear much sooner than the rest of the house. So they often need to be updated more frequently. But there are lots of other options when it comes to remodeling your home or expanding your living space. Who Needs the Gift of a Remodel? A young family with small children might like a redesigned play area or nursery. 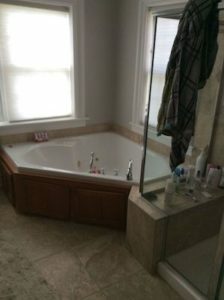 Create a spa bathroom where a mother of small children can “get away” for a few minutes of solitude. Give dad the man cave he’s always wanted. Finish off a basement for entertaining. Grandparents might like a space for visiting grandchildren. Re-decorate a bedroom for an aging live-in relative. Plan a complete kitchen redesign, the nerve center of every household. Design a room for a specific hobby could be a fun choice. 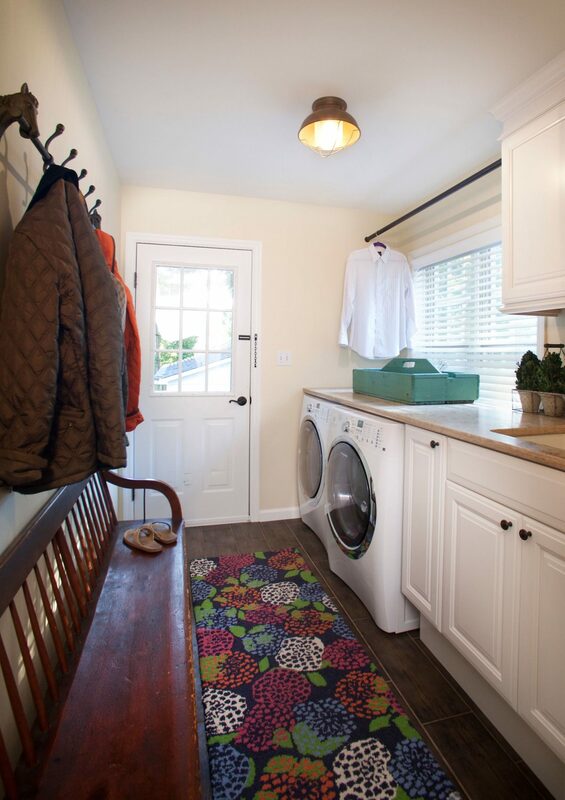 Change the life of a busy parent with a remodeled laundry area. Remodels don’t just change the way something looks. Remodels change the way we live. The possibilities are truly endless. The gift of a remodel is definitely the out-of-the-box choice that is sure to please. It is both generous and highly personal, since it requires the giver to know the habits, needs and lifestyle of the recipient. A remodel is something you might also considering giving yourself. Maybe it has become increasingly clear that the amenities in your kitchen no longer meet your family’s needs. Maybe your bathroom and closet need more space. 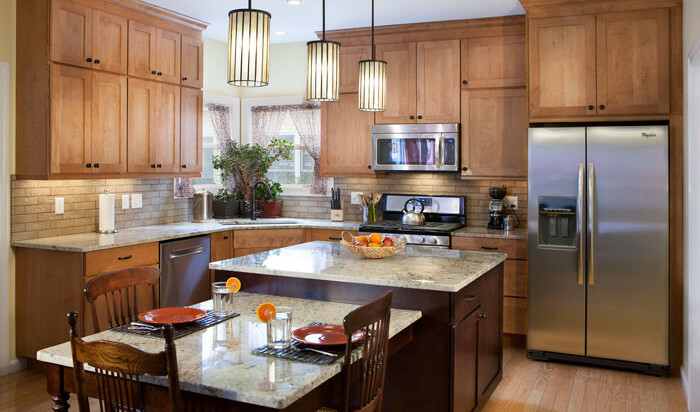 Kitchen and bathroom remodels yield the best return on investment for the value of your home. It’s also the best way to enhance the aesthetics of your living space. Holiday entertaining can be so much more fun, when you you don’t have to fight for oven or counter space. Consider some new amenities, like an extra wall oven or an island for potluck dinners. Imagine your family and friends together in a home that accommodates everyone comfortably. Adding a half bath or a family room can make all the difference when your guest list includes several families. While well-planned remodels take time, it’s never too soon to begin visualizing. Keep a running list of the things you would like to change and bring it to the Roeser Home Remodeling team. We can walk through your options and discuss materials and choices that will fit both your taste and your budget. The gift of a remodel, big or small, is actually a great idea. Just wrap up a Roeser appointment card and tuck it under the tree. The way we move about and live in our home affects so much of our lives. Our surroundings influence the way we think, our mood, our ability to organize and work, even the way we sleep. When you give the gift of a remodel, you are saying you care about someone’s environment and well being. Nothing could be more personal or more thoughtful. 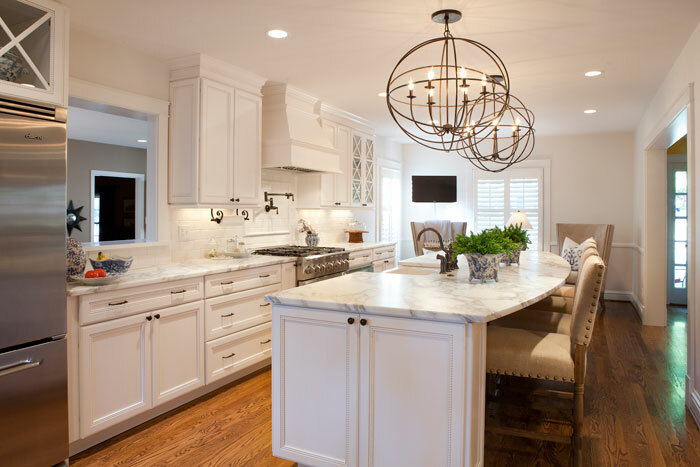 When you consider planning a kitchen remodel, it might at first seem overwhelming. It might take awhile to make the decision. After all, you have grown accustomed to what you have. You ignore the wear and tear of a busy family. You work around the growing list of small repairs and updates needed, until you just can’t. 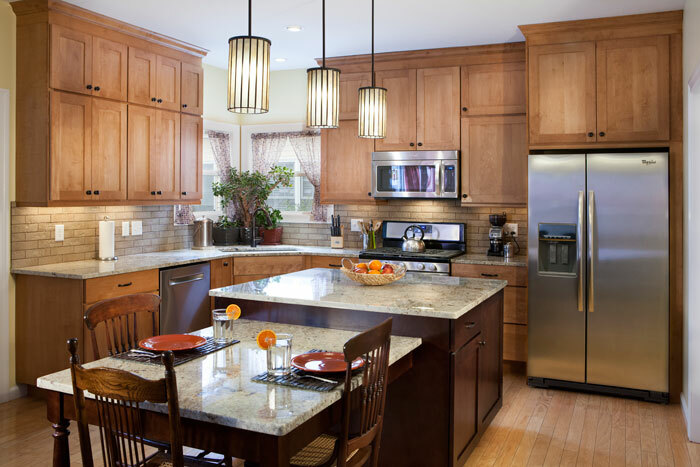 At Roeser Home Remodeling, we want to help you fall in love with your kitchen again. You might already be dreaming about how different it could be. Pouring over internet ideas and magazine spreads showing kitchen remodeling transformations can be inspiring. Why just dream when our award-winning team and can make your dreams a reality? Skeptical? Don’t be. We’ve created show-stopping remodels in the smallest of spaces and under some very challenging circumstances. Our team has both the creativity and the master constructions skills required to turn your kitchen into a space where you will love to linger. 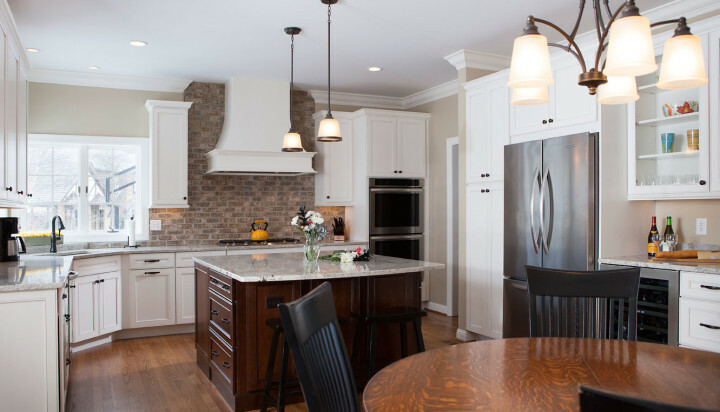 Roeser Home Remodeling of St. Louis wants you to know that your kitchen can experience a miraculous transformation and still be precisely within your expectations and budget. When you finally say, “enough is enough” Roeser Home Remodeling is here to help you every step of the way. Internet ideas? Great. Magazine spreads? Of course! These are two resources that can be used for inspiration. Roeser Home Remodeling will sit down with you and look at your inspired ideas. We will offer input and make sure that your kitchen transformation is not only miraculous, but trendy, beautiful and functional. Everything will be planned, down to the smallest detail. We will also discuss lifestyle and what your expectations are regarding your kitchen remodel. You may already have a style in mind. Perhaps you want to keep with the overall theme of your home while adding a modern flair. Many looks can be achieved by adding a trendy food prep area with a modern tile backsplash. This adds functionality with eye appeal. You will probably want to update your old cabinets. In addition to new cabinets, hardware can also add to the miraculous transformation of your kitchen remodel. Today’s hardware choices are infinite, and you will definitely find the perfect fit for your style. Roeser Home Remodeling with go over every detail with you and help you make your choice. Depending on the style of kitchen remodel you are going for, you may dream of a functional but space-saving kitchen island. Today’s kitchen islands are great additions for added prep space and added storage space. 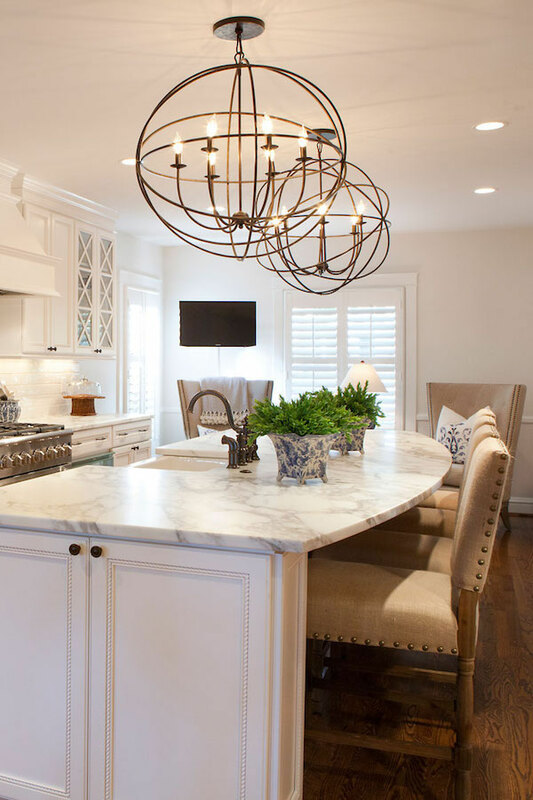 These kitchen islands can really make your kitchen remodel into an oasis for entertaining guests as well. If you have a large family or enjoy entertaining guests, the idea of a little breakfast nook or open area for dinner that leads out to a patio, might be the perfect solution. Roeser Home Remodeling can help you see how this transformation will fit any expectation when it comes to kitchen remodeling. Of course, with any kitchen remodel, there are standard kitchen items that will undergo change. We’ve already mentioned cabinets and hardware. Attention will be given to appliances, wall and flooring as well. 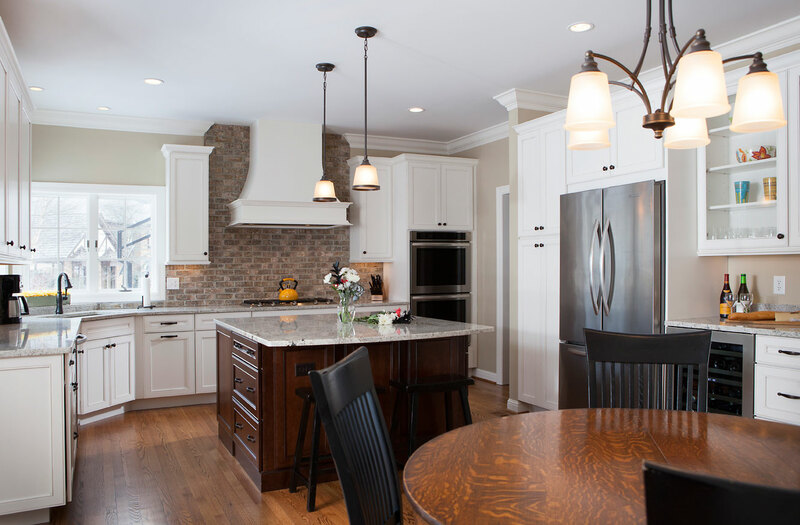 Call Roeser Home Remodeling and let us show you how your kitchen can undergo a miraculous transformation…one that will meet and exceed your expectations. Bathrooms are personal. It’s a private space designed especially for our personal care. It’s our personal space, or sanctuary if you will. Of course, you may have a vision of what you want your bathroom to look like, but maybe it isn’t quite there yet. The best bathroom designs should be functional but also stylish. There should be balance but also some pizzazz, a little spark that says, ahhh…. now I can relax! In keeping with practicality, your personality should shine through in all its glory. Your bathroom should be the space to get-away, a retreat where you can relax and be yourself. That is where Roeser Home Remodeling comes in. We are design and build experts when it comes to bathrooms and remodeling of bathrooms whether your bathroom is brand new or in need of a makeover. So, what’s your style? There are many to choose from. Hot trends in bathroom design and remodeling are always changing. 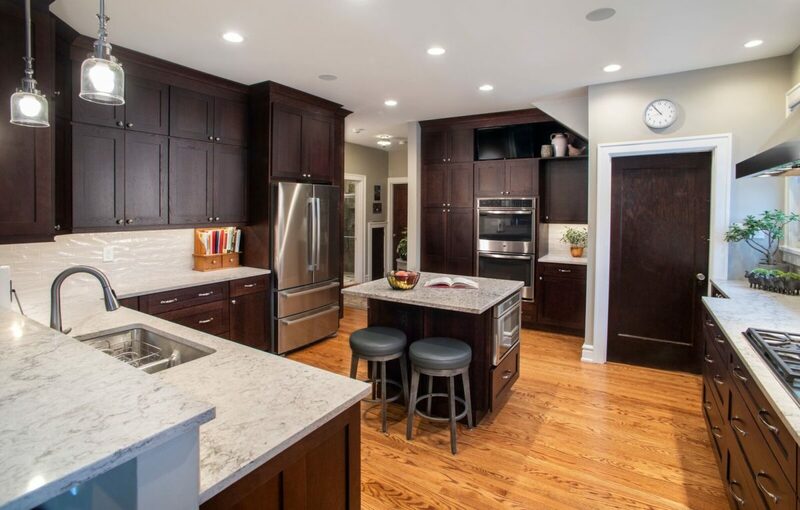 Roeser Home Remodeling of St. Louis stays on top of the trends. Our design and build concept brings all the elements of bathroom remodeling right to your doorstep. What is your dream bathroom retreat? 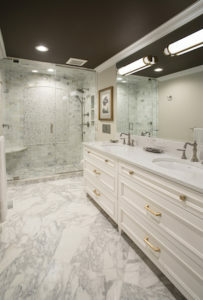 Spa designed bathroom remodels are one of the hot trends for this year. Clean open space with white walls along with natural wood and sleek, minimalistic elements will make you feel like you’ve walked into a spa retreat. Designed to be relaxing and pampering, this bathroom remodel will have all the benefits of a spa in the comfort of your own home. Contemporary designs are popular for adding luxury along with warmth in your bathroom design. Modern stainless-steel trim along with stainless sinks and metal accents give a sleek design that is very up to date. Mosaic glass tile and eccentric lighting adds warmth and interest to this bathroom style. elegant and soft tones, including cabinetry and vanity areas. 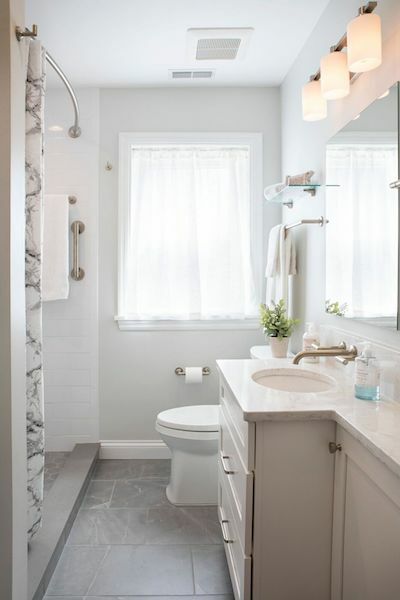 Marble, mirrors, and polished nickel plumbing fixtures all add to the elegance of a traditional bathroom remodel. The idea is to keep a simple design but add elegant accents. Another hot bathroom trend is to replace the existing tub with a larger, perhaps dual shower enclosure with a seating area. This is an excellent way of opening space and allowing the bathroom area to be more functional. Recommendations in the home design industry shows that there should at least be one bathtub in the home however, to retain resale value. Freestanding tubs with a nearby seating area is one way to update a look and retain functionality. Roeser Home Remodeling can make recommendations in harmony with all these factors. 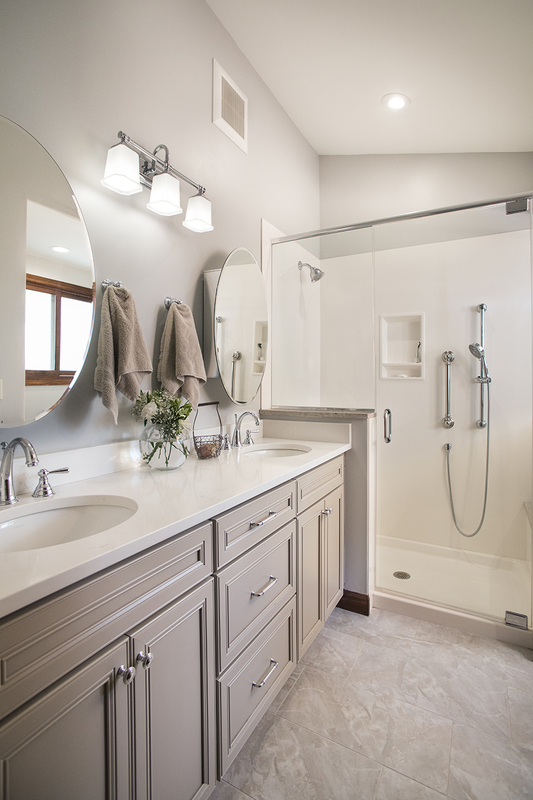 Homeowners today that are considering bathroom remodels have myriads of options to consider. Roeser Home Remodeling of St. Louis can take the guesswork out of the bathroom remodel and design your bathroom, turning it from a dream into a reality. Call us today for a free consultation. The Fall cleaning season is upon us. Cleaning out a closet can be intimidating and exhausting. When you open your closet, do you see order or chaos? If your closet could use a little more style and organization, it might be time to take it from a dressing room disaster to a gorgeous garment sanctuary. Dressing must be a consideration in any master suite design. 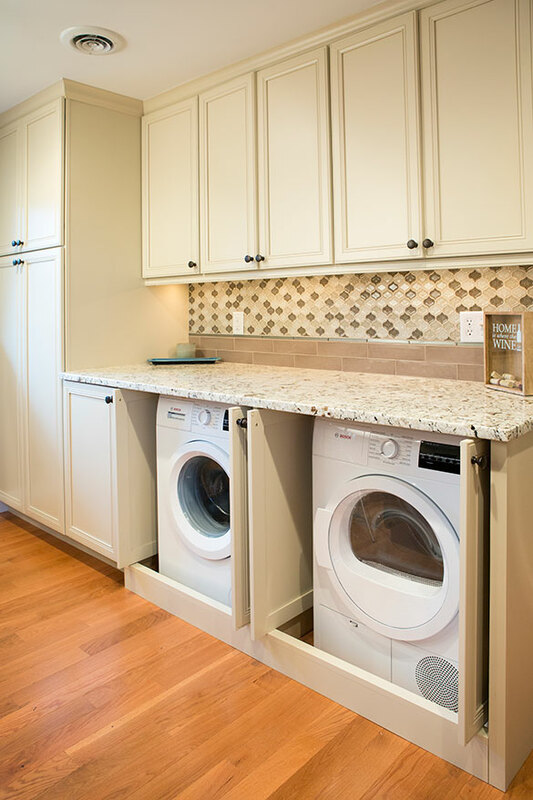 Roeser Home Remodeling offers a completely personalized experience for designing, building, and remodeling your closet and bath. All of our remodels are designed to accommodate your unique taste and lifestyle. You’ll be amazed at the difference a custom-designed space can make. Visit our Roeser Home Remodeling showroom, conveniently located in the St. Louis area, and start your dream remodel project. Whether you prefer the natural tones of rich, dark wood, or prefer crisp, opulent white, we’ll build a closet and dressing area that will leave you inspired and organized. There are so many options. We can design and build a variety of specialty storage accessories and closet islands. Traditional moldings and beautiful pristine lighting, (as seen in these photos), can take your closet from a mere storage space, to a private dressing sanctuary. Whatever your taste, the award-winning team at Roeser Home Remodeling will bring your ideas to life, all the way down to the hardware selections. In addition to the marvelous makeover of this delicious dressing room, this project also included a total bathroom remodel. 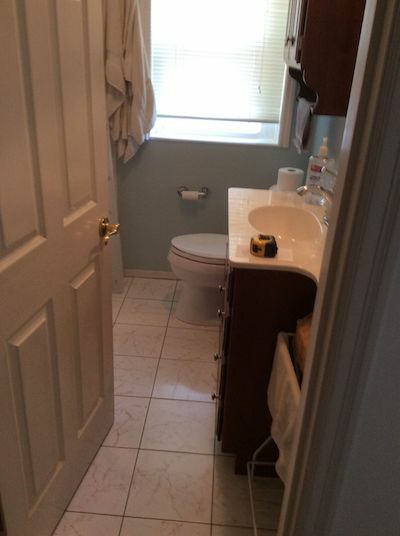 Bathroom remodels are frequent requests from homeowners. Transforming the space where you spend your most private moments can be a cleansing process. This master bath and closet are an exercise in traditional design. The bright light and clean lines make for a light and airy space. Contact our design team to see what kind of transformation we can make in your home, and in your life. A custom designed walk-in shower is becoming a more personalized decision. 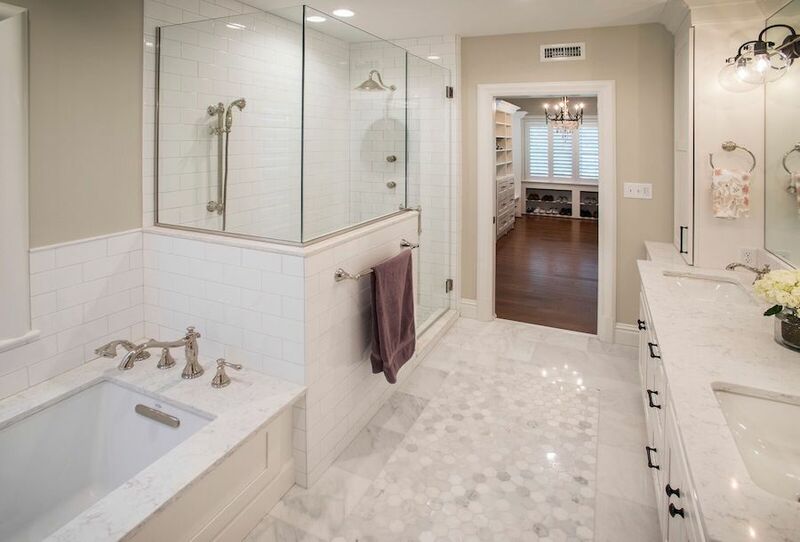 Homeowners are asking for spacious, spa-like showers. In addition to dimensions, there are many other choices when it comes to showers. They can be outfitted with features like massage jets, or rainfall ceiling shower heads. Large shower heads and multiple shower heads in the same shower are common selections, as homeowners are choosing to make their showers more comfortable and personalized. Special seating is also an option. 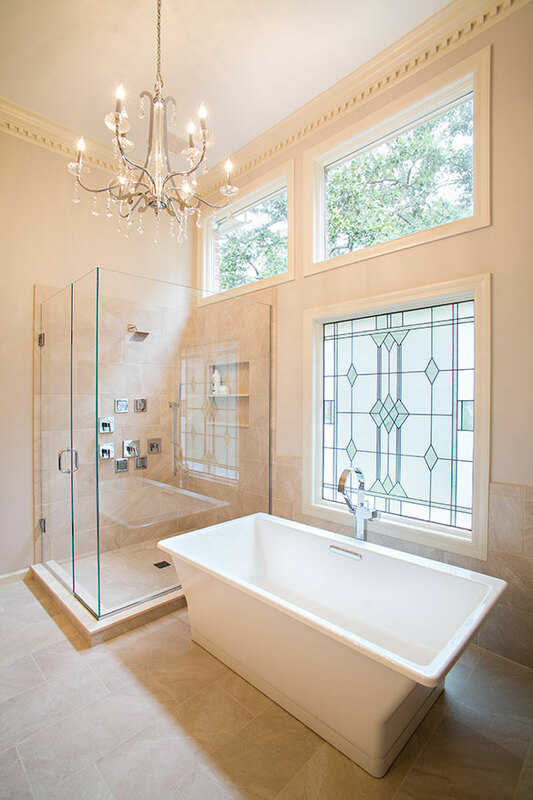 At Roeser Home Remodeling, we create relaxing, bathroom sanctuaries from ordinary spaces. We begin with architecture, which is so important when considering the overall feel of a remodel. Thoughtful construction can bring new light into a room or even change the way the air moves through a home. While architecture is important for function and design, the beauty of every remodel lies in the details. Hours of thought goes into the careful selection of tile, counters, hardware, lighting, the role of color and other details of each project. If you’re ready for a bathroom remodel, but don’t know where to start, feel free to contact us with your questions. The Roeser Home Remodeling team is your premiere bathroom remodeler in the St. Louis area. 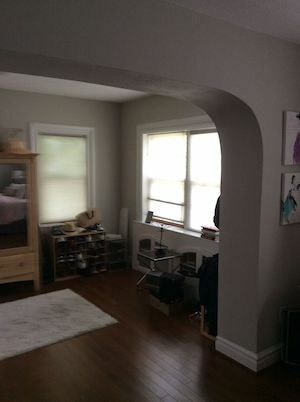 When you hire the Roeser Home Remodeling team for your closet and bathroom makeover, or any other remodeling project, you’re hiring local, talented master craftsmen with a lifetime of experience. You’re also hiring talented artists who have designed some of the most exquisite living spaces in the St. Louis area. We think our work shows our commitment to excellence and our commitment to our customers. Take a look at our portfolio to see some of our recent projects. Or call us today at 314-822-0839. A bathroom is our own private space designed especially for our own personal care. It’s our sanctuary, if you will. It makes sense then, that when it comes to bathrooms and remodeling choices in bathroom design, personality is the first consideration. Of course, you may have a vision of how you want your bathroom to look, but maybe it isn’t quite there yet. The best bathroom designs should be functional but also stylish. There should be balance but also some pizzazz, a little spark that says, ahhh…. now I can relax! In keeping with practicality, your personality should shine through in all its glory. Your bathroom should be the space to get-away, a retreat where you can relax and be yourself. That is where Roeser Home Remodeling comes in. We are design and build experts when it comes to bathrooms and remodeling of bathrooms; whether your building a brand new bathroom or in need of a makeover. So, what’s your style? There are many from which to choose. Hot trends in bathroom design and remodeling are always changing. 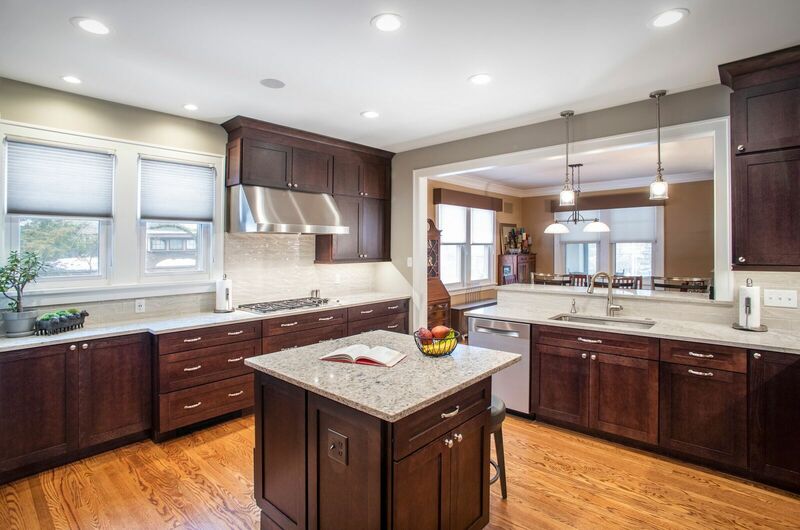 Roeser Home Remodeling of St. Louis stays on top of the trends. Our design and build concept brings all the elements of bathroom remodeling right to your doorstep. What does your dream bathroom retreat include? Traditional style bathrooms and remodeling elements are always in style. To update a traditional style bathroom, the trend is to open more space, use elegant and soft tones, including cabinetry and vanity areas. 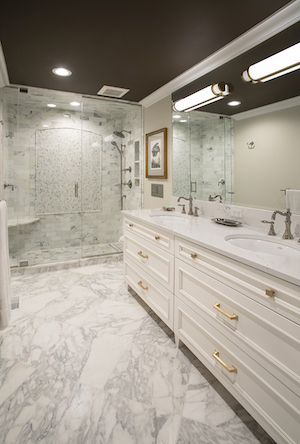 Marble, mirrors, and polished nickel plumbing fixtures all add to the elegance of a traditional bathroom remodel. The idea is to keep a simple design but add elegant accents.